‘Tiffin’ 12-2pm for Reclining Drunk by Gilbert & George at Nigel Greenwood Inc Ltd, July 17, 1973. Photograph courtesy of © The Nigel Greenwood Gallery Archive, Tate Archive, London. Over two decades, Nigel Greenwood Inc Ltd presented an extraordinary group of artists including Bernd and Hilla Becher, Bill Beckley, Marcel Broodthaers, Marc Camille Chaimowicz, Rita Donagh, Gilbert & George, Richard Hamilton, Alan Johnston, David Lamelas, Christopher Le Brun, Keith Milow, Bruce Nauman, Ed Ruscha, John Stezaker, David Tremlett, Richard Tuttle and John Walker. From 1972 to 1985, Greenwood ran the gallery from 41 Sloane Gardens, London, where he also lived. Visitors would encounter ground-breaking shows and enthusiastic conversation about the ‘now’ art on display. The exhibition will explore the special atmosphere of 41 Sloane Gardens, as a public exhibition space and home for Greenwood and an intimate, international group of visiting artists, friends and colleagues. Joel Fisher will be collaborating with students from the Chelsea MA Curating and Collections course to re-create his large-scale Apograph wall drawing (1973) and Marc Camille Chaimowicz has been invited to revisit his 1979 exhibition, Screens, incorporating original public/private domestic artifacts from the gallery and home. The exhibition will include material from the Nigel Greenwood Inc Ltd archive which has never been displayed before in public. Works and documentation will revisit landmark shows and publications by Bernd and Hilla Becher, Rita Donagh, Gilbert and George, David Lamelas, Ed Ruscha, John Stezaker, David Tremlett and the influential group exhibition, The Book as Artwork (1972). A publication edited by Phoebe Greenwood, including original contributions from Gilbert & George, Lynda Morris, Richard Cork, Ed Ruscha and Kynaston McShine will accompany the exhibition. Nigel Greenwood (1941-2004) was a gallerist and curator influential in the development of British art during the 1970s and 1980s. 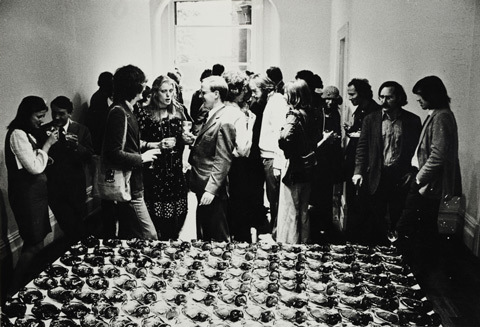 An early promoter of Conceptual art, he presented Gilbert & George's Underneath the arches and the first UK exhibition of Ed Ruscha's artists' books at his gallery at Glebe Place, Chelsea (1969-1971). After moving to a new location at Sloane Gardens (1971-1985) and then New Burlington Street (1985-1992) he continued to introduce new British and international artists, including Keith Milow, David Tremlett, Rita Donagh, David Lamelas, John Stezaker and Marcel Broodthaers. He played an important role in artist books’, opening the influential Nigel Greenwood Inc Ltd book shop in 1971 and publishing artists' books in relatively large editions (ca. 1,000) to accompany exhibitions, rather than catalogues, He presented the seminal exhibition Book as Artwork in 1972. He curated the Hayward Gallery Annual Exhibition in 1985. Nigel Greenwood Inc Ltd: running a Picture Gallery has been organized with Phoebe Greenwood and the Nigel Greenwood Art Prize. The Nigel Greenwood Art Prize is a new annual residency prize that supports independent-minded artists of all ages and gives them funds and a studio to complete work at pivotal moments in their careers. The winner of the Nigel Greenwood Art Prize 2016 will be announced on Tuesday 21 June at CHELSEA space, 6-8pm. All welcome.